Two Lincolnshire seasonal markets disrupted by the freezing weather have been fighting back. 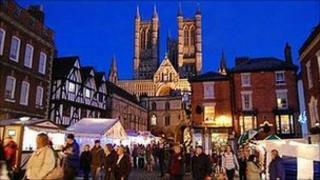 Both Lincoln and Louth Christmas Markets were called off earlier in the month due to snow and ice. Now Lincoln City Council has set up a virtual market online, where traders who had stalls booked can place links to their own websites. In Louth, officials and groups have worked together to hold a combined market this weekend. The Lincoln market is one of the largest of its kind in Europe and was expecting more than 150,000 visitors - but cold weather meant organisers did not feel the area was safe. Traders who had booked stalls and city businesses lost thousands in sales when it was cancelled on 1 December. Now dozens have posted links to their own websites on the council's main market site. Deputy Leader of the City of Lincoln Council, Councillor Marc Jones, said: "A lot of traders are looking for any way to get value out of the Christmas period and we want to help in any way we can. "This might even be an idea to roll out year after years and it is certainly something we will be looking into". Louth market was called off two weeks ago due icy roads and pavements. But it has now been combined with East Lindsey District Council's Christmas Event and about 150 stalls have been set up in the town centre.